The International Trade Administration’s (ITA) Assistant Secretary of Commerce for Import Administration, Paul Piquadoand I last week toured New Balance and Auburn Manufacturing, Inc. (AMI), two Maine companies that are producing high quality, Made in USA products. 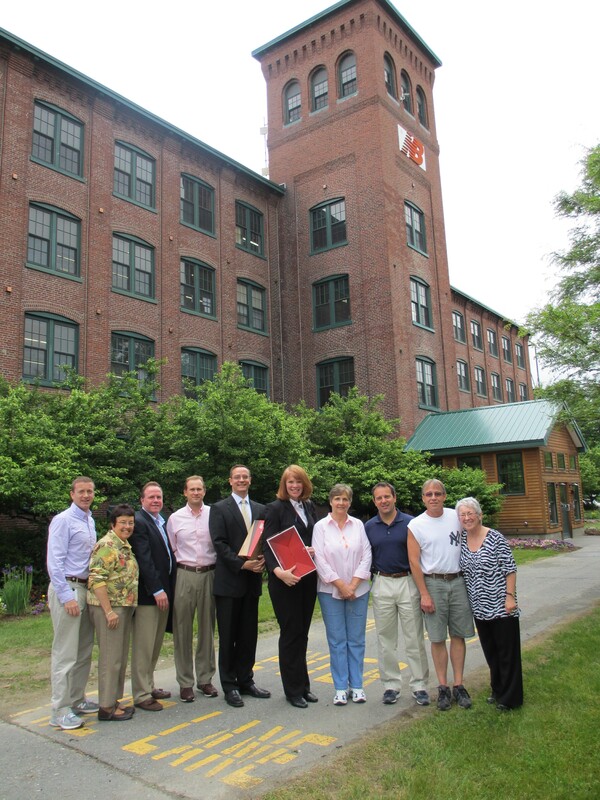 Assistant Secretary of the Import Administration Paul Piquado and Deputy Assistant Secretary of Textiles and Apparel Kim Glas in front of New Balance footwear factory in Skowhegan, Maine with workers and management following tour. At New Balance in Skowhegan, the tour showcased New Balance’s American-made and designed footwear manufacturing. The Skowhegan facility is one of five New Balance footwear plants located in New England, collectively employ roughly 2,700 workers. The company is the only firm that currently manufactures athletic footwear in the United States. At AMI in Mechanic Falls, we toured the company’s state-of-the art facility that produces fire- and heat-resistant textiles. AMI is a small, woman-owned business employing 50 people in the Lewiston-Auburn area. AMI produces textiles that protect people and processes from extreme heat and flames. AMI also manufactures end-use products including a patented, modular insulation kit, and a line of first-ever hot work safety blankets that are third-party certified. For over 30 years, the company has been producing advanced products that meet stringent U.S. military and safety standards. Its reputation as an industry leader is a direct result of an ongoing commitment to investing in innovation and technology. After the tours of the New Balance and Auburn Manufacturing facilities, Assistant Secretary Piquado and I had the opportunity to have a discussion with company employees and management, to hear their viewpoints regarding U.S. manufacturing, the challenges they face and the successes they have achieved. One focus of the Obama Administration is strengthening the economy by growing U.S. exports and export-supported jobs. Hearing directly from the workers at these two facilities helps us to better understand the challenges facing U.S. companies to achieving this goal. As locals know, the importance of exports to Maine’s economy is significant. Over one-sixth of all manufacturing workers in the state depend on exports. That is why this trip was so rewarding. One of the main objectives of our office – and ITA as a whole – is to promote the competitiveness of textiles, apparel, and footwear in the domestic and international markets, in support of U.S. industry and jobs. Both New Balance and Auburn are accomplishing this as they export their products worldwide – and our office is committed to helping similar Made in the USA brands have similar success. Please visit the Office of Textiles and Apparel website for more information about the services and information we offer.